We know that because researchers from the Jack, Joseph and Morton Mandel School of Applied Social Sciences at Case Western Reserve University asked them. In a qualitative study, researchers focused on Cleveland service providers who shared how foreclosure affects their clients. The research was recently published in The Journal of Contemporary Social Services. Service providers' observations of their clients' experiences yielded similar themes of foreclosure threatening children's education, family memories, sense of self and the desire to attain the American Dream—commonly represented by home ownership. "Take that away and the results of losing that dream are devastating," said Elizabeth Anthony, a senior research associate for the Mandel School's Center on Urban Poverty and Community Development. The research concludes that social workers have on-the-ground capability—and willingness—to mitigate impending financial calamity before it happens. In addition, the study highlights that further training could only strengthen social workers' abilities to stave off foreclosure. 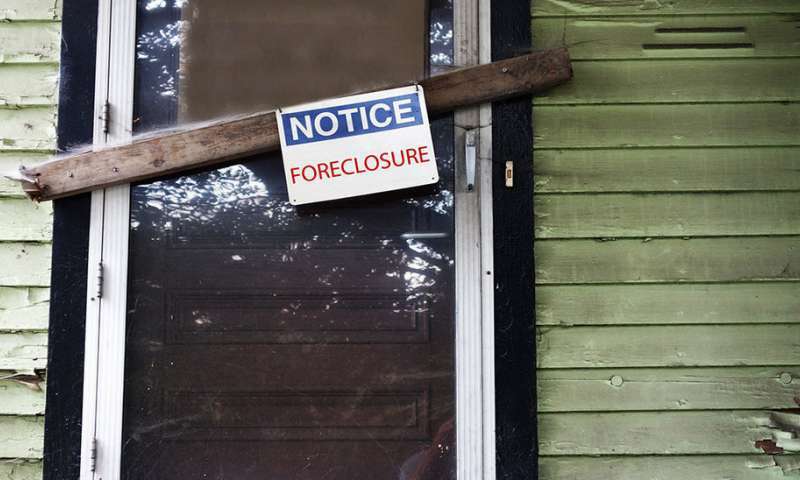 "Social coworkers could bolster services and support and connect people to the appropriate resources," said Anthony, noting that the 18 professionals working in community-based and governmental organizations charged with helping those experiencing foreclosure. The housing crisis—which began in 2008 as a result of too much borrowing and flawed financial modeling—had a detrimental effect on the national economy and in cities across the country. That first year alone, an estimated 861,000 homeowners lost their properties to foreclosure. "It goes without saying that home foreclosure had negative effects on children and families," Anthony said. "The loss of one's home fundamentally destabilizes a family unit and that has implications for school, work, community connections." The impacts of the 2008 economic recession in general—and the real estate crisis in particular—worsened the situation for already struggling cities and families. Job losses and depressed home prices left many homeowners owing more than their homes were worth. Additionally, the housing crisis highlighted seismic and widening gaps in racial equality, Anthony noted. "The impact of foreclosure has been disproportionate in minority communities that were targeted for subprime loans," she said. "Certainly, we hope that there's never another foreclosure crisis, but if there is, we could have (social workers) trained in the complexities and bureaucracies of financial institutions." The research suggests while foreclosure is devastating, families continue to strive toward future homeownership. "In general, the American Dream represents an ethos that hard work and determination bring prosperity, upward social mobility, material comfort, and ultimately a sense of self, of who homeowners are in the world," said Anthony.